Treadwell Evangelistic Empowerment Ministries Inc.
Apostle Albèr Tyrone “Trevy” Treadwell is a native of Hot Springs, Arkansas. He at present resides in Fayetteville, North Carolina. Apostle Treadwell answered the call and gifting of his ministry in 1987 at the age of 16. It was under the leadership of Pastor Dorothy Batts, and Co-Pastor Seles P Smith at Revival for Jesus Lighthouse located in Fayetteville, North Carolina. 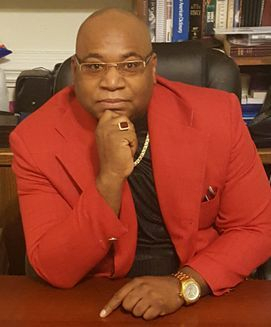 In 1989 he moved to Wichita, KS where he founded Expect A Miracle Evangelistic Ministries Inc.
Apostle Treadwell was ordained and served in ministry at PowerHouse of Love & Faith Center Inc. from 1990 until 2010 under the leadership of the now heaven retired "The Five Star General" Overseer Seles Parker Smith. In 1994 he commenced the PowerHouse of Love & Faith Annual Youth Convention along with Co-Pastor Oscar L. Bryant. From 1994 until 2000 he served as the youth president/coordinator. In 1995 Apostle Treadwell closed down the Expect a Miracle Ministries of Wichita, KS and relocated to Fayetteville, North Carolina to help the ministry of his home church PowerHouse of Love & Faith Center Inc. In 1997 founded the "Warrior of the Battlefield Conference" held every March, "Would the Real Man Please Stand Conference" held every December. In 2000 founded Treadwell Evangelistic Creative Ministries. In 2007 the name of the ministry was changed to Treadwell Evangelistic Empowerment Ministries Inc. He also founded the “Empowered to Tread Well Crusades” that are held annually around the United States. In 2010 founded The "Keep Your Ear to the Mouth of God Crusade & Prayer Breakfast," and the "Elevate Your Mind" Crusade. Apostle Albèr Treadwell knows firsthand that salvation is free but it cost to carry the anointing. During one of his seemly greatest trials he tried to throw in the towel, but God spoke to him and said "One of two things will happen if you just stay focused and steady your course. Either you're going to leave the storm or the storm will leave you. These tests and trials that you are going through are not for punishment or cruel intention. This is my time to brag on you. That my glory can be shown, not just to those that are lost, but those who doubted that I called you, chosen you, and qualified you, to be a light to all nations. You are abundantly blessed, highly favored, and abiding in victory." God has open various doors for him throughout the United States and internationally. Some of his points of ministry are Wichita, KS, Lincoln, NE, Magnum, OK, Colorado Springs, CO, Queens and Brooklyn, NY, Augusta and Atlanta, GA, Germany, Nassau, Bahamas and many cities throughout the Carolinas and Kansas. Apostle Treadwell has preached on several occasions for the "Queen of Gospel" Pastor Shirley Caesar, who has taken him as one of her sons. One of his greatest dreams came true when he preached on board the Carnival Cruise Ship "Victory” November 2003. He told some of the members of his church that went along, that he was going to preach on the ship. Their reply was, “Yeah! Right!” Can you imagine their faces when the cruise director announced all the way from North Carolina "Albèr!" 2016 "Keep Your Ear To The Mouth of God"